03 9666 4500 This link opens skype if you have it installed on desktop browser. Work towards your employment goals with job skills training to build your pathway to employment. What is the NDIS and what does it mean for me? When is the NDIS coming to my area? How do I prepare for my NDIS planning meeting? I have my NDIS plan, what do I do now? How can Yooralla support me? What is the NDIS and what does it mean for me and the person I care for? When is the NDIS coming to the area of the person I care for? Is the person I care for eligible for the NDIS? How do I prepare for the planning meeting of the person I care for? The person I care for has their NDIS plan, what do we do now? How can Yooralla support the person I care for and me? What is the NDIS and what does it mean for me and my child? When is the NDIS coming to our area? How can my child access the NDIS? How do I prepare for my child's planning meeting? I have my child's NDIS plan, what do I do now? How can Yooralla support my child? "Being a mum made me better at my job"
"The job has been a holiday from my studies"
Yooralla are recruiting allied health professionals to work as part of a multi-disciplinary therapy team using evidence-based practice; to support people with disability of all ages and needs to achieve their goals. To support you with implementing your NDIS plan, we've outlined the three key things that make up a NDIS plan, the supports that may be involved and how to use it. When you receive your approved NDIS plan, it’s important that it makes sense to you. If you need help interpreting your NDIS plan, you can meet with Yooralla for a free one-on-one discussion about what’s in your plan and how you can make the most of it. Here’s some other information that may help you. Part 1: About me This describes where you live, the people who support you and your daily life. Part 2: My goals - This lists the goals you want to work towards in the next 12 months, as well as longer-term goals. funded supports (what the NDIS will pay for). This section describes the support area, the budgeted amount, details and how the supports will be paid. At your NDIS planning meeting you would have been asked how you would like your plan to be managed. This means how you want your service providers and supports to be paid. Your plan will detail how you wanted each support to be paid for. Core funding – funding that covers your functional support needs for daily living and participation, and to access community supports and activities. Capital funding – funding that covers the purchase of one-off items such as equipment, technology or modifications. It also includes funding for specialist disability accommodation. Capacity funding – funding that supports skill building, training, learning, capacity building, accessing employment, improving health and wellbeing, and support coordination. Your plan starts (and is considered active) from the date the plan is approved – this date is listed on the front page of your plan. It is important that you start implementing your NDIS plan as soon as you receive it, so your supports can continue, even if you’re not happy with your plan. The reason for this is if you have existing funding (i.e. Individual Support Package - ISP), it will stop once your NDIS plan is approved. Yooralla’s free guide to Implementing your NDIS plan can help you with the steps involved in starting to use your plan and receive your supports. Have your NDIS questions answered at one of Yooralla's free one-on-one NDIS discussions. Many locations available. Yooralla can support you with a wide range of tailored, flexible and quality supports. Find accommodation with a level of service and support best suited to your needs. Meet with us one-on-one to make the most of your NDIS plan. Stay informed on the NDIS! 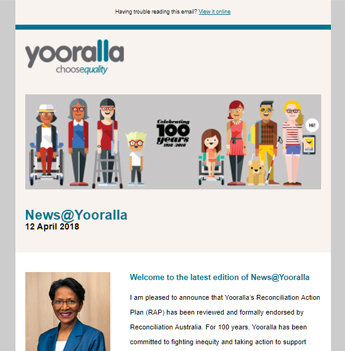 Yooralla is a registered Fundraiser (under the Fundraising Act 1998) with Consumer Affairs Victoria. Registration number 10804.15.